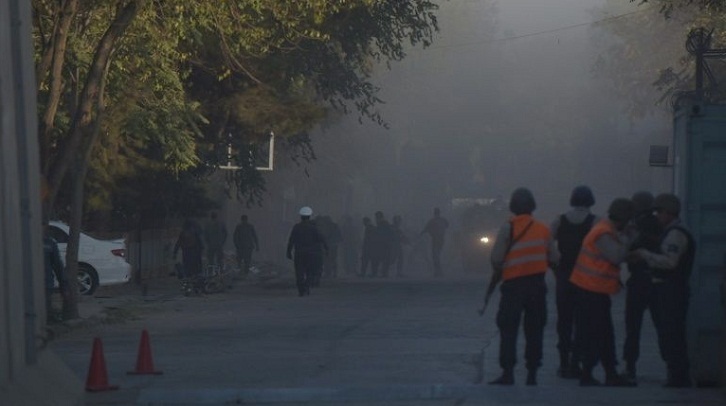 A suicide bomber believed to be as young as 12 struck Kabul's heavily fortified diplomatic quarter on Tuesday and killed at least four people, showing that militants can still hit the heart of the city despite tighter security. It was the first attack targeting the Afghan capital's "Green Zone" since a massive truck bomb ripped through the area on May 31, killing or wounding hundreds, and prompting authorities to strengthen protection. "The suicide attack was carried out by an underage bomber, a boy we think 13 or 15 years old, killing at least four and wounding over a dozen more civilians," interior ministry spokesman Najib Danish told AFP. Defence ministry spokesman Dawlat Waziri said the attacker "made it through the first checkpoint but was stopped at the second checkpoint and detonated." "We don't know the target but it happened a few metres from the defence ministry's foreign relations office. There were no casualties to our personnel," Waziri said. "I was 100 metres away when the explosion happened and as I ran towards the site I saw several people lying in blood -- one had been hit in the head and was moving. It was a horrible scene," an eyewitness told TOLOnews. Another witness told AFP: "A lot of people were dead and injured and there was no one to carry them away." AFP reporters heard a loud explosion around 4:00 p.m. (1130 GMT) just as workers would have been leaving their offices to go home, followed by the sirens of emergency services. The attack struck the heart of the city's diplomatic area, where many embassies and the head offices of major international organisations including NATO's Resolute Support mission are located. On October 20 a suicide bomber pretending to be a worshipper blew himself up inside a Shiite mosque during evening prayers, killing 56 and wounding 55. Over the weekend Taliban insurgents, some wearing night-vision goggles, killed 22 Afghan policemen in separate attacks on checkpoints. Security in Kabul has been ramped up since the May 31 truck bomb that went off on the edge of the Green Zone near the German embassy, killing 150 people and wounding 400 others.